Fużūlī (Azerbaijani: Füzuli فضولی, c. 1494 – 1556) was the pen name of the Azerbaijani of the Bayat tribes of Oghuzpoet, writer and thinker Muhammad bin Suleyman (Azerbaijani: Məhəmməd Ben Süleyman محمد بن سليمان). 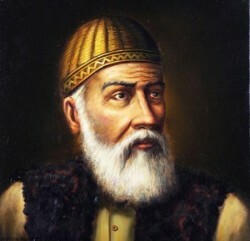 Often considered one of the greatest contributors to the Dîvân tradition of Azerbaijani literature, Fuzûlî in fact wrote his collected poems (dîvân) in three different languages: in his native Azerbaijani and also in Persian and Arabic. Although his Turkic works are written in the Azerbaijani language of the Turkic language family, he was well-versed in both the Ottoman and the Chagatai Turkic literary traditions as well. He was also well versed in mathematics and astronomy.